This is the perfect recipe for two. The filling and crust are portioned out and frozen until needed. All 8 can be baked at once as well. This recipe will also make one large pie. If you are in a hurry, you can substitute a 15 oz package of refrigerated pie crust for the Buttermilk Pie Crust. The crusts will need to be rolled and cut to size. 1. Early in the day, prepare one recipe of Buttermilk Pie Crust or your favorite two crust recipe. Divide into 8 portions. Form each portion into a disk, wrap in plastic, and refrigerate. 2. In a very large saucepan, combine both sugars, the cornstarch, tapioca, cinnamon, and salt. Mix well. Gradually stir in the water and lemon juice. 3. When all the peaches have been peeled and diced, set them aside while you bring the liquids to a boil over medium-high heat..
4. Stirring constantly, boil the liquids for one minute, or until very thick. 5. Stir in the peaches, reduce the heat to medium, and cook until the peach mixture starts to bubble around the edges. 6. Remove from the heat and stir in the butter. 7. At this point you can either freeze the filling in 8 individual portions, along with 8 portions of crust frozen separately, or you can continue and bake as many as desired. 8. To bake; Pre-heat the oven to 400° and lightly butter individual baking dishes. 9. 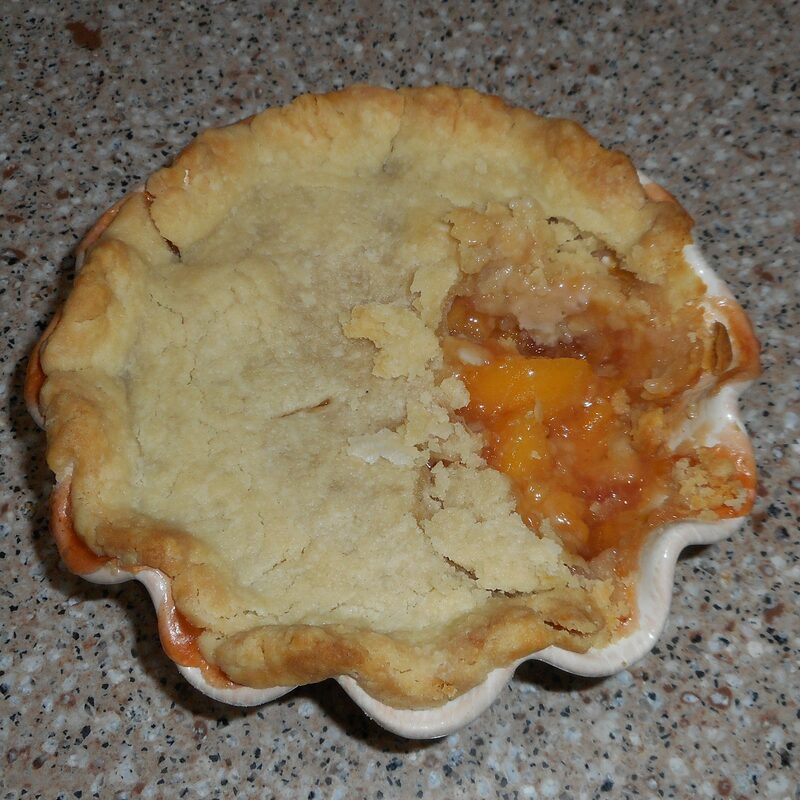 Fill each baking dish with a portion of peach filling, thawed if previously frozen. 10. Lightly dust a sheet of plastic wrap with flour. Working quickly, roll out each crust to fit and top the pot pies. Cut 3 slits in the top of each crust. 11. Place the pot pies on a baking sheet in the pre-heated oven, Bake 20 minutes or until golden brown.